This blog is intended as an occasional diary of information to feed back to hoverfly recorders in the UK and elsewhere. Inevitably there will be issues of interest that are in some way relevant to invertebrate ecologists and consequently I intend to use the medium as an opportunity to develop thoughts on pertinent topics. It is worth remembering that we cannot go back and create data once the day has past, so making as full a record of what we see is a way of preserving a point in time that may be useful in the future. If you see something and can be sure of its identity, then log it and submit it! Modern databasing systems cope with vast quantities of data so there is no problem about volume. The bigger problem comes when people selectively submit data. Are all species treated equally, or is there bias towards the more ‘interesting’ species? If there is bias, then the commoner species appear to be rarer and the rarer species commoner. The most telling lesson comes from the BTO’s ringing programme, which actively discouraged ringing of house sparrow until it was too late and the decline (crash) had happened. Commoner species are often the bellwether of the natural world because they tell us a lot about the wider landscape. Rare species are rare because their ecological requirements are more precise, and these are much more scattered (but may have been widespread in the past). The HRS encourages daily recording as this helps to paint a picture of the seasons and years. Sadly, we have lots of evidence of sensitivities to changing weather patterns, but older data are so limited that we cannot go back and test ideas against previous major events such as the 1976 drought. BUT, if we make sure we have the data now, our successors will be able to do so much more. The problem comes because there is a commonly held misconception that recording schemes are simply about mapping distribution. That was the case when schemes started in the 1960s and 1970s but once modern computing because available and powerful a wide range of new opportunities emerged. I’ve written previously on the use of opportunistic data and its use in occupancy modelling. Most, if not all, recent reports on the status of British wildlife are based on this modelling (and HRS data are part of this). The more complete the data the better. It is worth recording the gender of the animal, what it was doing and whether it was associated with a particular plant. BUT, there are complications – some insects will sit on flowers but not be taking pollen or nectar – so be sure that it is actively foraging and say, ‘at flower of …’. A note saying ‘on lupin’ is meaningless – it might be sunning on lupin leaves or feeding at the flowers; we get lots of data of this sort and, sadly, it is impossible to use. 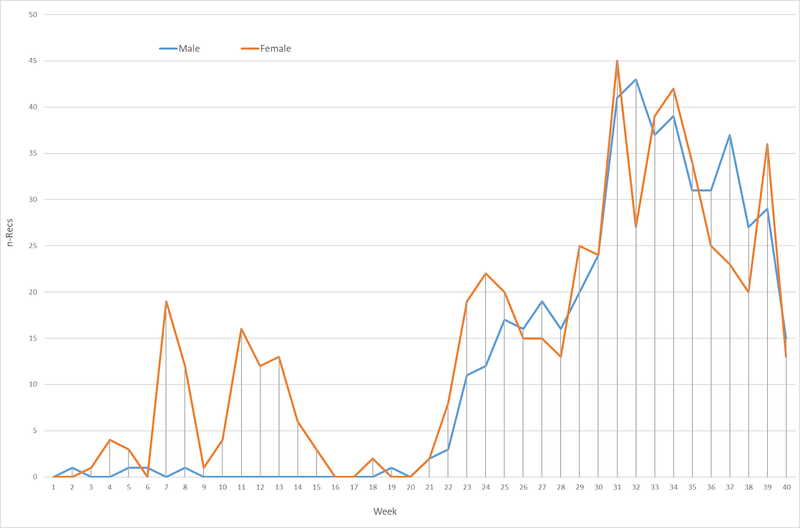 As a simple illustration of what we can do with data on gender, Figure 1 illustrates the differences in phenology of male and female Eristalis tenax – without full data extracted from records from social media we would have a far less complete picture because most people submit records just naming the animal with no associated information. Figure 1. 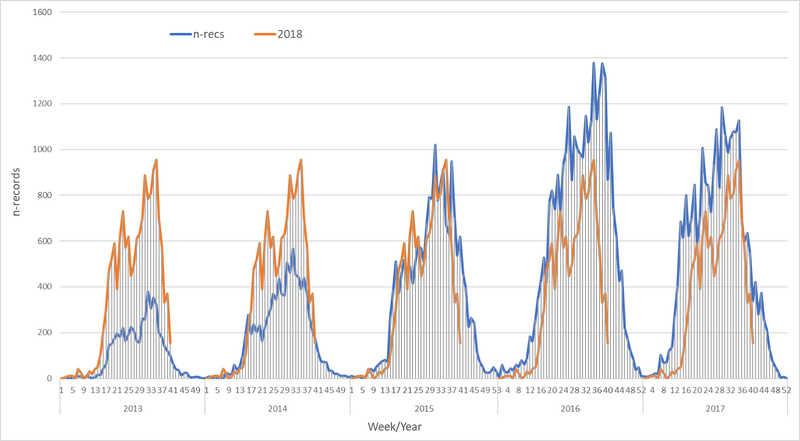 Phenology of male and female Eristalis tenax in 2018. Without regular and detailed recording of a seemingly common species we would not have such a complete picture of its over-wintering ecology. What is the preferred route for records to reach schemes? There are numerous ways of submitting data to schemes: spreadsheet, Mapmate synch, downloads from other databases (e.g. Recorder), iRecord and posting on Facebook (where schemes extract directly). Scheme organisers are not a uniform bunch, and each has their own preferences. Some schemes definitely prefer iRecord; others do not! Again, I have written about the issues we have with iRecord, so take a look! Speaking strictly for the HRS, we prefer spreadsheets or databases downloads/synchs for big blocks of data. I do all of the verification for hoverflies on iRecord and it is probably the most frustrating job of the year! So often people submit a record based on a photo where you can tell what the gender is, but it is not logged. If I go in and adjust every record then there will be months of work and I simply don’t have the time, so the information is lost. I also get immensely frustrated when I see the same photograph used to support a series of records from different dates – can I really believe the records? Equally, I get frustrated when several posts of the same species for the same date and place – why not one post and save both me and you time? I am far more sanguine about extracting data direct from the Facebook group. Until very recently I have done this but thanks to a wonderful team of volunteers we now have a group of data extractors (a HUGE thanks to David Rayner and the team – Chickena Lurve, Sue Kitt, Katie Stanney and Adam Kelsey). This data has been an important stage in developing the data because there is much more consistency in the validation of records; I now use this independent of the main dataset to look at some of the ongoing responses to the environment – it provides real-time data to work with. We must always remember that scheme organisers are simply the custodians of the scheme and the data that have been assembled. Schemes should (hopefully) pass between generations and provide the foundations for our successors. Each scheme operates independently, and some are far more active than others. There are a few schemes that are essentially moribund because the organiser has ceased to be actively engaged but cannot be persuaded to pass on the data and the responsibility. Most are active to some degree but may not engage with media such as iRecord. Some schemes (e.g. moths, dragonflies, plants) have a network of county records, but many are effectively ‘one-man-bands’. The numbers of active recorders for most taxonomic groups are very limited and there are fewer still people who are prepared to take on administrative roles. Where schemes are active and engaged, there should be data transfer to the NBN on a regular basis. Here, I must put my hands up and say that the most recent HRS data are not on the NBN because we are trying to clean up the dataset and mark-up the dodgy records (it is a monumental task). We do, however, pass on data to research groups as and when we are asked. So, when you see reports based on wildlife statistics you can be sure that HRS data are part of the mix. I cannot remember how many requests we have had this year – maybe half a dozen. In the case of the HRS, incoming data are loaded into RECORDER as the storage platform – Stuart Ball is the data manager, whilst I am simply the front end who deals with the wider administration. The data are used to inform a range of products, most notably the maps in the WILDGuide and the analysis behind the 2014 Species Status Review. We have a problem with the original HRS website (Stuart managed to break the mapping system and has never found a way of repairing it). Stuart is developing a new site, but it is not on active release (links are often provided to the FB group) – it is one of the multitude of jobs that are reliant upon a small nucleus of people who run the schemes. In theory, Stuart and I should be writing a series of research papers based on Stuart’s occupancy modelling. We have a lot to say but seem to be stuck in the drafting stage! Meanwhile, I do try (intermittently) to provide a bit of feedback on this blog – scroll through the posts and maybe something will be of interest. A poor year for Volucella pellucens? As the summer progressed I became increasingly aware that we were not seeing many records of Volucella pellucens and whilst in the field it was noticeable by its absence. Was I imagining things or is there some justification for these feelings? Its season is now over unless we see a stray individual in the next couple of weeks, so perhaps a bit more sense can be made of the data? I've tried a variety of ways of expressing the data in graph form and think the two following versions do help, but they are tricky to interpret! The first thing that strikes me is that the height of the female peaks in 2015 and 2018 (Figure 1) are of similar height. There are two possible reasons: comparatively fewer males were recorded in these years; and the season was shorter in these years. In the case of 2018 I suspect both factors are at work. Rather more significantly, I think Figure 2 indicates that numbers in 2018 were substantially lower than in previous seasons and hence the peak for females is markedly down on preceding years. The male peak seems to be broadly analagous to 2015 and 2016 but is substantially smaller than 2017. Some inter-annual variation is to be expected, I don't think we can make too much of this. 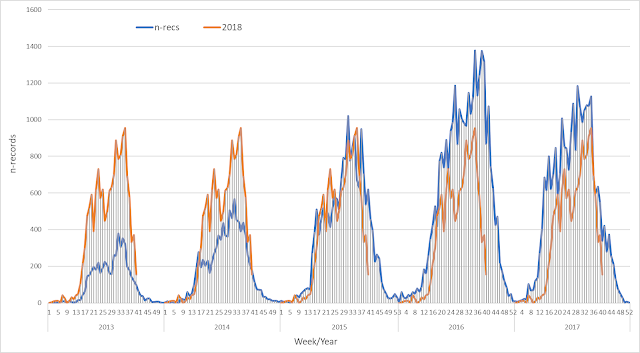 What is possibly more significant is the substantial gap between the male and female peaks in 2018 that coincides with the heatwave between weeks 25 & 28 (i.e. 20 June to 10 July). At this stage, it may be conjecture, but there is the possibility that the heatwave had a significant effect on the lifespan of the male generation and possibly also that of the females. If so, why might this be? It seems unlikely that the heat itself would have been a problem - the flies could simply have sought out shady places, especially as they tend to be woodland denizens.I think the more probable explanation is that neither males nor females could access sufficient nectar because normal sources had failed due to the heat and water stress. Is this a species that has suffered as a result of the heatwave? Will the impact be expressed in numbers present in 2019? Only time will tell! Figure 1. Volucella pellucens records extracted from social media covering the years 2015 to 2018 and represented as proportions of the records for this species in each year. Figure 2. 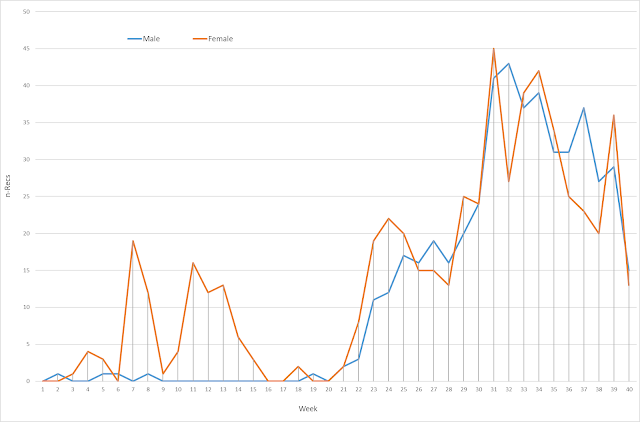 Volucella pellucens records extracted from social media covering the years 2015 to 2018 and represented as proportions of the records of all species in each week. The onset of an early Autumn? I have just been looking at the data for the past 6 years to see whether it is possible to say how 2018 compares with previous Autumns. On the ground, it seems as though the numbers of records has dropped precipitously this year and that this has been matched by the numbers of species; but is this really the case?Moreover, do major storms completely knock down numbers? I tried various formats for presenting the data before I hit upon the idea of superimposing 2018 over preceding years as a running process. So, Figures 1 and 2 present the numbers of records and numbers of species. 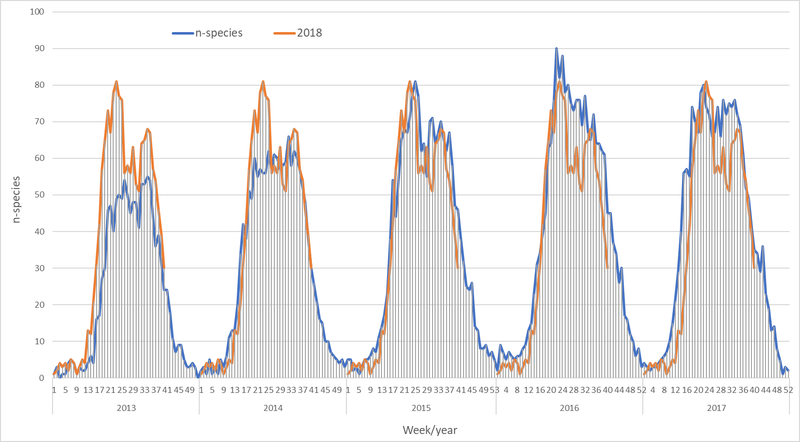 I think what they show is that 2018 is substantially down on previous years in terms of the numbers of records, but that the numbers of species encountered is still holding up quite well against previous years. Figure 1. Numbers of records extracted from social media between 2013 and 2017 with those for 2018 superimposed. Figure 2. Numbers of species in data extracted from social media between 2013 and 2017 with 2018 superimposed. A post on the UK Hoverflies Facebook page today raised the question of why Callicera spinolae took so long to recognise and be added to the British list? It was part of a wider question about the lack of both C. rufa and C. spinolae from Verrall’s 1901 monograph. The answer is perhaps worth setting out in a blog post because it highlights the huge difference between 1901 and 2018, and what has happened in the intervening 117 years. In today’s world, where we can jump in the car and travel to the far north of Scotland in less than 12 hours, we tend to forget (not realise) what life was like at the turn of the 20th Century. There was very limited public mobility – only the extremely wealthy could afford a car, roads were poor and travel long and arduous. So, most people recorded from a local area. People, when they did travel, went to the honeypots – hence the old collectors all went to the New Forest or to a few places in Speyside on the railway – you can read their accounts in the journals of the day and then find the specimens in the NHM collection (e.g. the Volucella specimens of FC Adams). There is something rather special about holding a specimen that was the subject of a short note in the EMM or Entomologist’s Record over 100 years ago; it provides such as poignant connection with the past. We now have access to a vast literature too. My library contains the main works from northern Europe. What is more, quite a lot are in English or have keys in English. That was not the case even a generation ago! The literature in 1900 was extremely limited – prior to Verrall’s work you would have had to have access to a substantial library of major foreign monographs and a big reference collection. This sort of facility would have been confined to the major museums of the day, or the extremely rich (or both). People tend to forget that today we have access to comprehensive (and cheap) literature plus the internet at the touch of a button. It was a rich man’s game then – hence being dominated by the likes of Verrall, who was course Clerk at Newbury Racecourse, or Yerbury (Lt. Colonel). In the case of Callicera they were probably a lot less abundant. They are hard animals to find, even now, and although C. rufa is extremely widespread in Scotland I cannot remember when it was last recorded there as an adult. I work Speyside on an almost yearly basis at around the right time of year and have never seen it. Larvae are relatively straightforward to find. In the case of C. spinolae, I think it has genuinely become commoner and is expanding its range. It now makes a mockery of Schedule 41 – BAP Priority species that is popping up all over the place! I’m fairly certain the same obtains for C. aurata. I think the chances are that C. spinolae was an accidental vagrant that may only have set up transient populations until recently. I checked GBIF to see whether Callicera were any more abundant in Europe and am far from certain they are! There are precious few C. spinolae depicted, but I wonder if that is partly because there is taxonomic confusion with C. aurata and perhaps even C. aenea? There have never been vast numbers of Dipterists; and especially so when it comes to taxonomically competent Dipterists. There is a strong British tendency to consider our fauna to be so well-known that we don’t expect other species and as we didn’t have access to European keys we never thought much about what else there might be. When Alan Stubbs wrote his book in 1983 the best he had was Seguy and van der Goot – and you know the British ability with foreign languages, especially Dutch! An indication of just how few competent Dipterists there are was shown by the data in the last atlas – of 750,000 records, half were supplied by just 20 people. Even today, I would reckon there are probably fewer than 20 who might be considered anything approaching Alpha taxonomists! And there are now no Syrphid specialists in the major museums. We can always reflect and wonder what we might have found, had we been able to investigate the Britain of 1900, but to do so we would have had to be able to travel and to access comprehensive literature. This is the price we pay for progress: on the one hand we have books, fast travel, the internet etc. On the downside we have destroyed a lot of the British countryside in a quest for better living standards. It is especially sobering to think that the Great Man himself died of Dropsy at the age of just 64 – I cannot imagine that happening today with our wonderful health service. An retired ecologist with over 30 years experience in statutory nature conservation and biological recording. I am joint organiser of the Hoverfly Recording Scheme (with Dr Stuart Ball) and am extremely committed to developing new capacity in insect identification and biological recording.